Once you have decided on piano lessons for your son or daughter you will need to find a teacher. Fortunately, there are many fine teachers out there. Of course you want to find a good teacher so that your child will learn and have a wonderful experience. This begs the question what is a good teacher? Good teachers are young and older, men and women. They teach at their own homes, at music stores, and sometimes travel to students homes. Some have advanced degrees, some have no university degrees but have a lot of professional playing experience. Good teachers can be firm, or they can be easy going, serious or funny. Good teachers are certainly a diverse group of people but all good teachers care about helping others learn to play the piano. Here are some ways you can begin to find a good teacher. The easiest way to find a good teacher is to ask another parent who is having, or has had a successful experience with that teacher, Do you know someone who’s child plays very well and is enjoying taking lessons? Ask who his teacher is. This is not a guarantee that your child will love the teacher, but it is a great way to find a good teacher. This is a bit controversial but I think that the second place to find a good teacher is Google. Let’s face it, most of us Google everything. Many of my students found me by Googling “Piano Teacher Wellington Florida”. Check out prospective teacher’s websites. Serious teachers put a lot of work into building their businesses, and most have websites. You can gain a lot of information about a teacher before you even make the call. 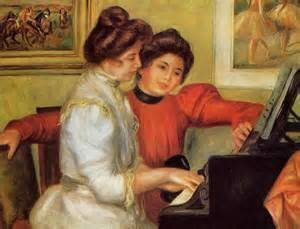 You can contact your city’s chapter of the MTNA (Music Teacher’s National Association) they are an organization comprised mostly of piano teachers and ask for a recommendation. If you live near a university that has a music department or a conservatory you could contact them. Some of them have excellent preparatory programs. Finding a good teacher is crucial to your child’s music education and not an easy task. Piano teaching is completely unregulated which means anyone can hang out a shingle and declare themselves a piano teacher. To begin with I believe you should look for a teacher who either has a university or conservatory music education, or some serious professional playing experience. It is true that all good players are not good teachers, but all good teachers are good players. Finding a teacher who is a well accomplished pianist is step one in the process. It is also important that your child’s teacher takes teaching seriously. Look for someone who invests themselves into teaching. Do they have other students? Do they have a well thought out method of teaching? Have they attended workshops or participated in some form of ongoing piano related teacher education? Are they members of a professional teaching organization? Is teaching the piano a big part of their professional life? Do their students play well? Do they have a blog, and write their own piano method books? (just kidding, I do this, it’s not a requirement for being a good teacher). I wish that I could give you a sure-fire way to find the perfect piano teacher for your child. But I can’t. Even the best teachers don’t suite all students all of the time. There are many variables, not the least of which is personality. What works well for one person may not for another. You have to choose the teacher you think is best and see how things go. Don’t worry to much though, your child will do just fine. After all she/he has you as a parent and you care about piano lessons enough to be reading this. Don’t be afraid to ask your prospective teacher questions. A good teacher will welcome them. In the next blog post I will address what questions your should ask when interviewing a teacher, and what questions the teacher may ask you.